South-east Region chapter in Atlanta of Ekal Vidyalaya Foundation of USA celebrated reaching of One Million Children milestone with a musical extravaganza on March 03, 2012 at the Impact Conference Hall inside Global Mall. It was a sell-out event attended by 400+ patrons. Ekal had invited two young rising singers Samir Date and Dipalee Somaiya from Mumbai (India) to help them celebrate the milestone and raise more funds to continue its mission to eradicate illiteracy among the children from rural and tribal India with holistic empowerment. An article was published on it. Click here to get the article. EGL is truly a battery charger. My Conviction became more firm and stronger in Ekal Mission. I feel much better with renewed confidence and faith in India that is Bharat” said Dr. Yashpal Lakra of Detroit – USA who attended EGL Second time in Chhattisgarh. 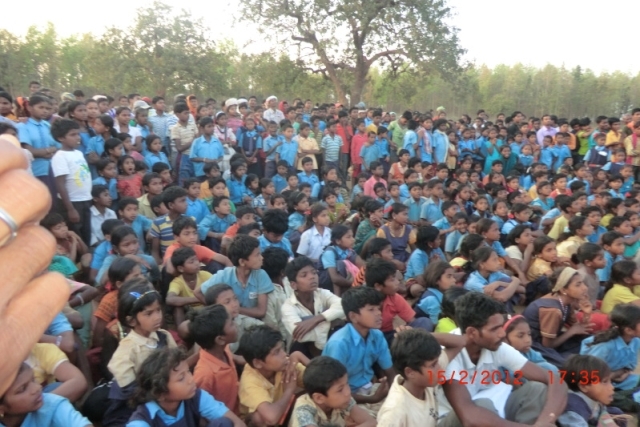 The First EGL was in Jharkhand in 2004-05. Sri C.Shankar from Dubai, Dr. Rakesh Gupta, Ritu Linhart, Vinod Ji and Prabha Jhunjhunwala from US, Mr. Saransh (IIT BLR), Dr. Bhavana, (Chennai), Smt. Sunita (Ranchi), Smt. Pushpa (Kolkatta), Sri J.K. Jhavar, President GMY( Chennai), Sri Naresh Jain, Sri G.D. Goel, Darshna Ji, Deepak Jain from BLSP Delhi, Anshul Dave Engineer (Raipur), Sri Prem Khurana, Electrical Engineer from Delhi together made a fantastic group of learners in EGL in Chattisgarh from 13th – 16th Feb 2012. They were accompanied by Sarvashri Kamal Sarda, Sri BP Jalan and Sri Anil Daga of FTS Raipur. Sri Daga kept everybody enthralled with his detailed knowledge of Chhattisgarh and its glorious history. The EGL group unanimously declared the tremendous impact of “On the Spot Learning” of Ekal works in just four Days, has opened their eyes. Their ‘vision’ has been broadened. Their heart, mind and soul have got stirred and rejuvenated. The first hand experience has enlightened them about ground realities of Indian Villages. Ritu Linhart who left India at the tender age of eight said with some passion, “Ekal got me reunited and reconnected with India, land of my heritage. After EGL, I love India more than ever. So much beauty of heart and emotions lies here in villages. Lot of positive vibes I feel in and around these Ekal villages of Bastar region. Thanks to Ekal and EGL”. Ms Sunita, Secretary of Ranchi FTS, confessed about her true learning and understanding of Ekal System during four days of EGL which she could not do even after four years of association with Ekal. “I am taking a lot of Positive energy with me. No scope of Nirasha (depression) in Ekal working now,” said Sunita. The young team of Saransh, Bhavna, Prem Ji and Anshul Dave were really awestruck by the whole range of experience through direct interaction with children, villagers, teachers and full timers. Everything was beyond their imagination. “EGL is highly educative” they said. They advocated EGL must be compulsory for urban volunteers like us. We feel great about our association with Ekal. The management of ‘Ekal System’ in the Ekal village of Emilipara with local people is amazing. One cannot believe unless witness it, said saransh and Anshul both young engineers. “My imagination has got new wings. I may fly high in the sky with new ventures in Gramotthan, expressed Bhavana. Ritu promised to send at least one person from each region of EVF USA to join EGL every year. Why not have two EGLs in a year, She asked. They vistied Ekal school in Emlipara, Rath Yojan in Pusaphal, had lunch with the villagers in Ekal Gram at Tattipara, Katha Ayojan in Nalajhar, Teachers Training at Lamdaguda, waterfall and temple at Chitrakut, Sports Competition at Sadgud (Upsanch), Saptahik Patshala at Ramphal Dhamtari Anchal Centre – farewell lunch and sharing experience with Samiti members. Need not to say, every project has its beauty and significance. Saptahik Pathshala (Vermi Composit) was extremely knowledgeable. Sports competition of Ekal Students at Upsanch level was full of energy and enthusiasm. Teachers Abhyas Varg (training) was truly enlightening. The dedication of Ekal cause was so evident among lady teachers that touched everybody’s heart. “Uphar Samman” of teachers was also performed there by Samiti members in respect of Sankranti. Samiti members of Anchal, Sankul and sanch centers were present in good numbers to welcome EGLrs. These local supporters of Ekal got very much inspired by the distinguished visitors Team. The Anchal Vyavastha varg (workshop for finance management and evaluation) at Jagdalpur resort was highly informative. The learners saw how the reports of MAR and MWR are generated and evaluated. EGL as a whole answered many questions which resolved so many doubts which are normally asked by our donors, supporters and urban volunteers. Gramothan presentation by Sri J.K. Jhavar added extra merit to this EGL and made it special. The meticulous planning was done by Dr. Satheesh, Sri Bhubneshwar Sahu and Prof. Manjushree with their Team of Fulltimers. All the arrangements were looked after by FTS Raipur Team. Thanks to Sri Kamal Sarda, Sri B.P. Jalan and Sri Anil Daga for their support at every step and making this journey memorable. The credit for all out success of this “Knowledge Journey” shall be given to the EGL Team who were highly spirited, sporting and really keen to learn and of course very – very cooperative. Inner Wheel Club of Coimbatore adopts Ekal Vidyalayas. It is one of the premier Women’s clubs in Coimbatore. Smt. Kishore A.Shah (President, Inner Wheel Club of Coimbatore) handed over the cheque to Smt. Taramani Chandak (Org. Secretary, FTS Coimbatore) during their meeting. Last year, the same club adopted schools and also visited the village. Guwahati Chapter of FTS celebrated its sixth annual day function on January 14, 2012 at ITA Center, Guwahati and a mono-act play by Sri Anupam Kher “Kuchh Bhi Ho Sakta Hai” was also staged. It’s biographical play that narrates important events of Sri Kher’s life. I got a lifetime opportunity to spend 2 weeks (3rd Feb to 17th Feb, 2012) observing and understanding Ekal Foundation's work in tribal belts of Assam (11 days-Tejpur, Gulaghat, Shivsagar and Dibrugarh district) as well as Chhattisgarh (4 days - Ekal Global Learning). During this time I have seeing many Vidyalaya (Ekal’s informal schools), interacted with Acharyas (teachers), travelled with Ekal's volunteers and seen the reports made by them. 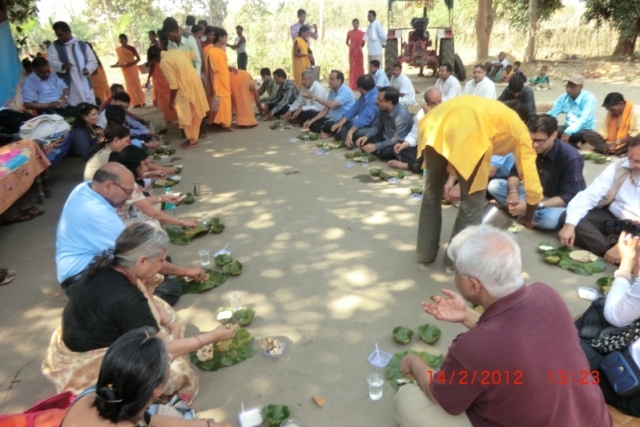 My stay was arranged either in Ekal's Karyalayas (offices) or house of villagers and Samiti people. Ekal has arranged the whole program so beautifully that I got a chance to observe every aspect of Ekal, understand its philosophy and see various training programs as well as interacting with full time Volunteers at every level. I express my gratitude for Ekal which has spent time and resources for my visit and making it a wonderful experience. Before this trip I have seen Ekal only through its website. As the concept was appealing, I decided to visit it from the grass root to the top level. After this trip I found that the work happening at the ground level is exactly what is mentioned on the website word by word at the conceptual, structural as well as execution level. In fact the website is very modestly written!! 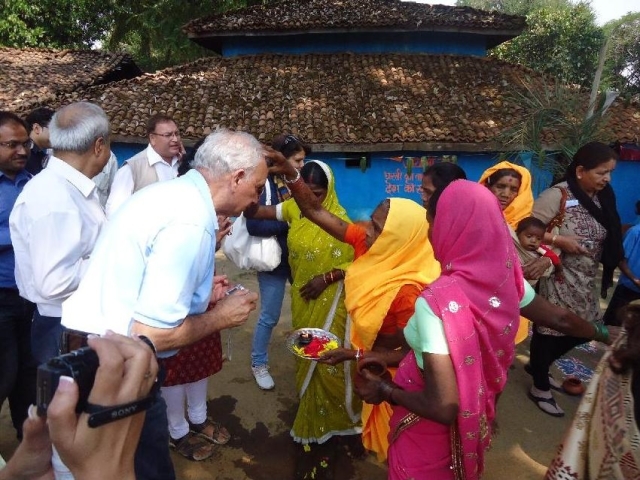 Whenever we visited any village or tribe, the hospitability by people was overwhelming. There the meaning of "Athithi Devo Bhava" is easily understood. For instance, in Moran Tribe (Assam), whole tribe used to assemble, beating drums, singing and dancing to receive us and honored by offering garlands, applying Iika (kumkum) and performing “Aarti”. Adding to this was the delicious food that was served with utmost reverence. Ekal Vidyalaya is working for development of India by making villages prosper through education, healthcare, empowerment, moral values and development. On interacting with Acharyas and children, I got to know that before Ekal Vidyalaya very few of the children were going to school in their villages. But today as I have seen more than 90% of the children are enrolled with government schools. This was due to the interest for education that has been aroused in children by innovative informal teaching mechanisms of Ekal. Most of the Ekal Vidyalaya seen were either running in government school buildings, anganwadis or in a structures erected by villagers for this purpose. Apart from education, the self confidence and moral values that were found in students was amazing. They beautifully introduced themselves and confidently answered questions. It was a great fun talking to them and listening to their poems. In the area of village development, the training imparted to villagers by Ekal has increased the practice of organic farming and many houses were having pits for vermi compost. Along with these programs Satsang has played a very big role in implicitly uniting them thus helping in reducing disputes, engaging people in developmental work and also in reducing alcoholism. In one of the tribe that I visited, people collectively clean the roads of their area every Sunday. And every house contributed one handful of grain daily to generate money for development. 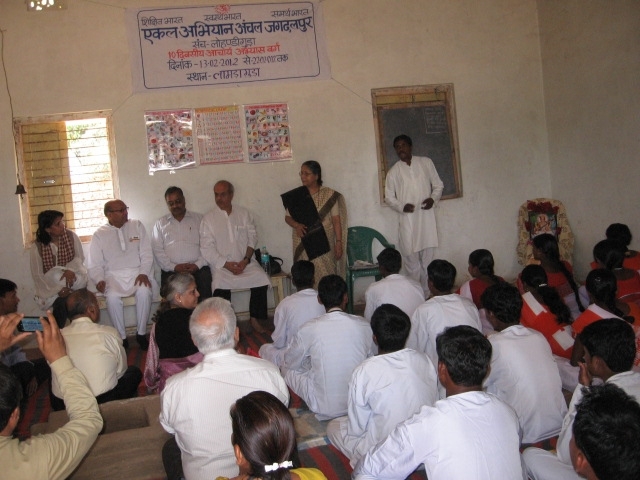 Ekal's health education has helped greatly in making people self sufficient in treating small issues. This has reduced the cases where small injuries/illness because of untimely treatment lead to bigger problems. People were also aware of hygiene and cleanliness. As far as empowerment is concerned, Ekal has achieved great heights in empowering villagers especially women. In Assam I was really surprised to see that most of the Acharyas and many full time volunteers are women. For instance in Thelamara Clusters in Assam out of 27 Acharyas, 26 were women. Also people became aware of RTI and government schemes for them. The Acharyas and volunteers are normally from the villages. The programs for training them are very well designed and have imparted self confidence in them. This I observed greatly in this cluster after talking to volunteers like Anita ji (who supervises this cluster) and Acharyas. The huge success of running 36,000 schools country wide is attributed to many factors but I felt the most important is motivation to work for nation, sheer dedication and honesty of volunteers. They work day and night and that too in very difficult situations. They travel miles on foot and cycle for reaching in the interior areas where there is no transportation, face problems because of insurgency groups and many other situations. One such incidence that I remember is, in one of the training programs in an interior village Raju ji (a volunteer) had reached there by travelling 7 km on foot and had to return by foot. I also got a chance to understand the reporting mechanism of Ekal. It has a systematic and a well managed account of very detailed data to the level of attendance of each student. There is also a robust organizational structure in place which facilitates efficient flow of planning from top to bottom and flow of reports from bottom to top in the organization. The beautiful concept of having a Samiti (part time volunteers) to manage finance and other activities adds to legitimacy and transparency. For example even small expenses claimed by any volunteer has to be attested by at least three people (one has to be of Samiti) to get it approved. Samiti also plays a paternal role for the volunteers providing them confidence and motivation. It was a wonderful journey that gave exposure to rich cultural and moral heritage of our country. It gave hope that there are people who dedicate their life for nation and in our country also something good is happening. I am thankful to God for giving me this rare opportunity of spending 2 weeks with Ekal. I wish all the success to Ekal Vidyalaya in its work of nation building. 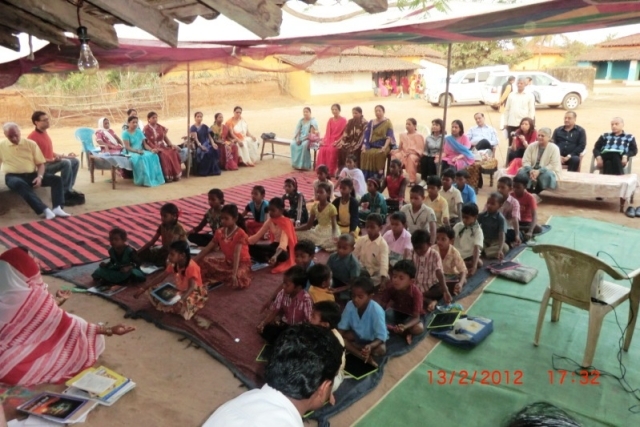 SUNDESH team visited two Ekal Schools in Panchsheel Nagar, Uttar Pradesh on 17th March 2012. SUNDESH is a non profit organization founded by Dabur India Ltd. SUNDESH Team comprises Sri Pradip Burman, Chairman, Dabur India Ltd., Dr. Gautam Vohra, Managing Director, Dabur India Ltd., Smt. Vijay Shiromani, Social Worker, Sri Mohan Singh Saini and Sri Kuldeep Seth, Retired IAS. Sri Vijay Sethi, Sri Uttamji and Sri Amarpal from EVFI participated in Vanyatra. First school visited was in Kakrana village of Distt. Panchsheel Nagar in Uttar Pradesh. All were welcomed by garlands and flowers. The name of teacher was Manisha. She was teaching the students in a small room. 28 students were present in Vidyalaya. SUNDESH team became very happy after visiting the school. They distributed sweets, chocolates and biscuits to the students. Students were disciplined and followed the teacher’s instructions. They sang together in good rhythm and also exposed the Indian culture. The second village was Daulatpur Dhikri of Distt. Panchsheel Nagar in Uttar Pradesh. The team were welcomed warmly like the first village. The name of the teacher was Vandna. She was teaching the students. Number of students present were 26. Sweets were distributed to children and they were asked questions which were answered satisfactorily. The parents of the children were all watching the proceedings from the windows and door with a lot of excitement. SUNDESH Team was informed and shown the other activities namely preparing of Organic Manure by Pit Formation Method and Basic Medical Aid. The Chairman of SUNDESH Team took keen interest in going through the different basic medicines and the FIRST AID KIT being maintained in the FIRST AID Box provided in the village by EKAL.